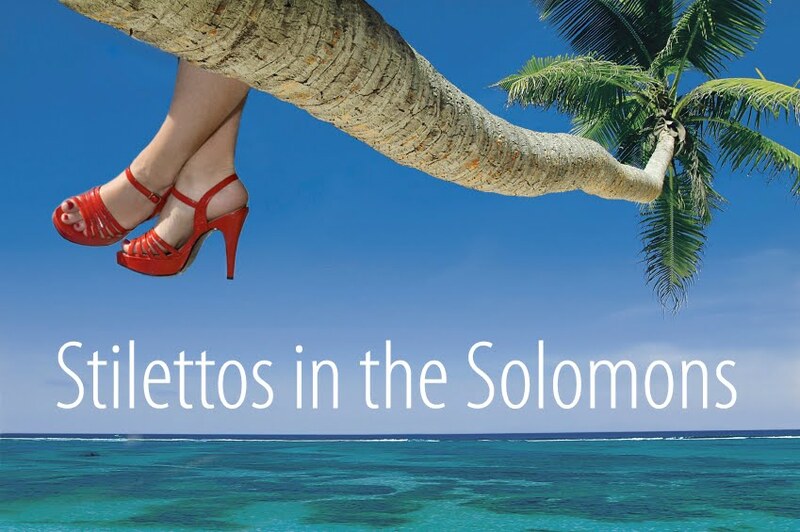 Stilettos in the Solomons: How Sara got her groove back...Part Two: Jump! How Sara got her groove back...Part Two: Jump! The next day is a blur of food, snorkeling, hammocking and sleeping. One of the big things about Maravagi is the hope of swimming with manta rays. Maravagi is parallel to another large island and the current between the two is strong. Nutrients from the sea are funneled in this tight spot and the mantas feed in this current. Homer, Brianna and Alex chat with me and attempt to unravel the case of Sad Sara. Each friend has their own way of tackling the problem. Alex strokes his long reddish beard whilst being the best 500 team member a girl could as for. Brianna takes the much more feminine approach, talking long walks with me and allowing me to vent. Homer however tackles this problem with action. The jetty I so fearful gazed down on becomes first priority. After lunch one day, he takes me out and throws his snorkel and mask into the water and takes a running jump. I’ve never jumped off a pier or a jetty or whatever you call it. I stand looking at the clear water some two metres below me. I waver but I leap into nothing. I make impact loudly and without much grace. Plus I screamed all the way down. Salt water splurts up my nose and stings my eyes. Homer urges me to put my mask on immediately and I do so. The huge school of reef fish moves in odd shapes below me. The sandy bottom is clear of big reefs, except to the left and angles steeply down into the tropical blue. Although life surrounds me I find it surprisingly calming to look out into the blue nothingness. I take on the observer role again, swimming between large rocks covered in coral. A set of clown fish try to attack me as I threaten their home. I may be frightened of many things but I know I take Nemo. Again, I jump into the water, this time, instead of falling without grace, I shuffle a good three steps first before I leap. Homer cheers me on and says he thinks I'm ready for the manta rays. My stomach drops. But I can't stop now; there is a big smile on my face for the first time in weeks. One of the big things about Maravagi is the hope of swimming with manta rays. Maravagi is parallel to another large island and the current between the two is strong. Nutrients from the sea are funneled in this tight spot and the mantas feed in this current. The idea is this: a boat takes you out in the middle of this channel and drops you off. You float in the sea until you get your full manta ray experience and the boat comes back to pick you up. Sounds wonderful…and absolutely terrifying. We plan to go in the afternoon. I’m ready, I’ve got all my positive self talk in my head but it gets called off. Now I have a full 24 hours to sit and think about stuff. I find its better to jump and not have plenty of time to process things, now I'm stuck with time to kill. Probably time to go back to the reef. This time we go in the late afternoon as the sun is setting. The fish are completely different this time of day. The schools dart quickly and the lazy romantic setting changes to feeding time. Everyone is on the look out for the bigger fish hunger for a bite. Our friendly fish come out and nibble our feet. I get the sense that this is not the best time to be swimming on the reef. We head back quickly to the shallows and see a reef shark dart quickly out of it as we are coming in. The night is filled with laughter, Solbrew and friendship. I feel really supported by this little family of friends. Alex strokes his ginger beard and reads the back of Solomon Times, a classic novel about living in the Solomons, in a variety of accents (the Scottish one was particularly good) that have the rest of us in stitches. The next day, another successful snorkel takes place. When I get back to the lodge, I can’t hide anymore. The manta rays trip is on. The first trip out on the boat nothing is spotted. My friends hop overboard and hang off a rope like lures behind the boat. I decide to wait until mantas a spotted to get out. The mantas are shy and we don’t see any. Everyone is disappointed but me. We head back to shore for lunch. The resort sends out a boat again in the afternoon with a stack of pikininis (children) piled on the front of the boat to spot the mantas. The boat comes back quickly with the kids squealing in delight. Mantas have been spotted and the group scrabbles for snorkels and fins. I flop out of the boat with the grace of one of those hippos from Disney's Fantasia without a tutu. Here I am in the open ocean with no life vest...not even some floaties on my arms. Great. I clutch onto Homer like a koala bear. He pries me off on and grabs my hand. I put on my mask and get my first look at the ocean below. Nothing but blue. No bottom. I curl up into a little ball trying to be as small as possible. I hold Homer's hand tighter than Kate Middleton's death grip on her father's hand when she walked down the aisle. Fish are swimming below me at speed, fighting against the current that is now pushing me into shore. I'm a bit relieved to be going to a place where I can see the bottom. Then the current whips up strongly and I can't see anything below me at all. Not even a fish. The current is so strong that even without any wind, white caps form at the top of the waves. My breathing speeds up and I hope the monsters of the deep can't hear my heart racing out of my chest. This is by far the deepest water I've ever been in. I relax after about five minutes but by that time we have missed the manta rays completely and are now being pushed far into shore. The boat swings round for another pick up and we all climb in. My entrance is by far less graceful than when I jump into the water with Will, a strapping Aussie lad hauling me up by the back of my board shorts. We turn around and start at the opening of the channel for another round of manta hunting. Again I flop into the water, following Homer in. I put on the mask and gaze into the blue world below. Within two minutes, Homer squeezes my hand and points to the deep left in the water. There she is, gliding through the water. Her wing span must have bee two meters (six feet for you yanks) and her large eyes gaze up at us. For a moment she seems suspended in a place that has no current, no movement. And then she picks up speed and is gone, ghosting past us into the deep. I exhale, not realising that I had been holding my breath. And that was it. That was all I got.